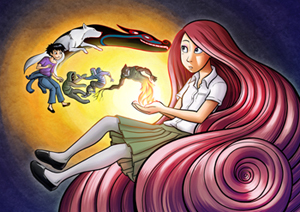 Gunnerkrigg Court is...and that’s often as far as I get when I try to explain it to people. It’s not just dark fantasy, or high school dramedy, or an exercise in surreality. Nor is it just a combination of those things. It takes those components and many others, and under artist-writer Tom Siddell’s steady hand congeals into something deeper and more fully formed than just a bunch of ingredients swirling in a pot. The titular Court is a mysterious, vaguely dystopian K-12 school located somewhere in the English countryside. It’s an oasis of technology located across a ravine from the wild and magical Gillitie Wood, the Court’s ancient adversary. On both sides of the bridge ghosts, robots, minotaurs, dragons, knights, and Native American death gods are facts of life. Every human myth, at least so far, has proved to be true. And tangled in the middle of all of this is Annie Carver, a girl whose adventure begins one day when she notices that she’s acquired a second shadow. Starting with just Annie and her new shadow, Siddell has gradually built up a deep bench of colorful supporting players and an equally rich world for them to inhabit. He’s also provided a host of mysteries to help drive the plot, ranging from the whereabouts and agenda of Annie’s disappeared father, to a decades-old murder mystery the Court has done its best to bury, to the machinations of the forest’s ruler, Coyote. But where other comics might take these mysteries and range after them full-throttle, Gunnerkrigg intersperses plenty of vignettes that just show the characters living their lives. Never does it feel like filler; instead, each story serves to deepen the characters and their motivations, as well as reader attachment to them. And so when major plot points do rear their head, they bear real weight by altering the landscape just as the reader’s gotten a solid footing in the way things are. No matter how fantastical the stories get, Siddell takes care to ground them all in two things: genuine emotion and lots of research. Over the course of the strip, Siddell has demonstrated expertise concerning paganism, alchemy, post-Medieval fencing swords, the Pleistocene Epoch, and pretty much every mythology in human history. And to boot, he’s made all of it plot-relevant (his expertise on wimples less so, but still entertaining). I’ll say this: I read a lot of webcomics. Several each morning, in fact. And on Mondays, Wednesdays, and Fridays, Gunnerkrigg Court is the one that I save for last, knowing full well that whatever’s on the page will perfectly set the tone before I finally crawl out of bed to start my day. I’ve been reading this comic for three years, and it hasn’t failed me yet. 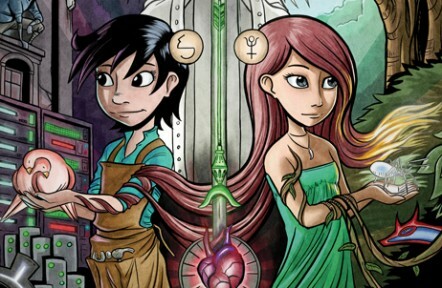 Gunnerkrigg Court is written and drawn by Tom Siddell. It updates every Monday, Wednesday, and Friday. It may be found here. I would add two more pieces of praise. As his art style has evolved, his character have also *aged* in a realistic way, which is unheard of for comics. And he has the most cast-iron update schedule of any comic I read -- I don't think he's missed a scheduled day since I started reading years ago.